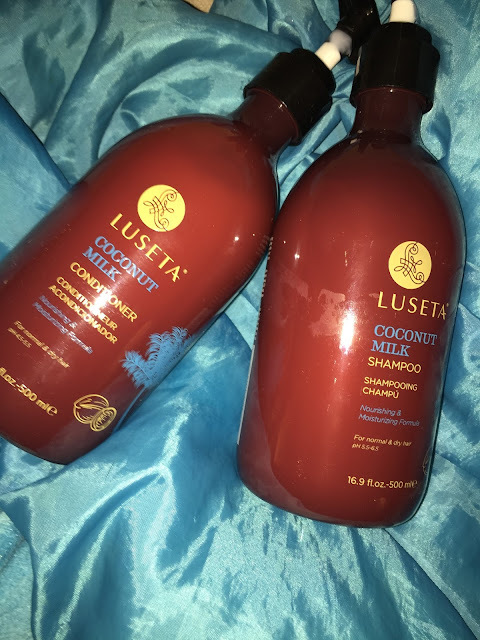 I LOVE the smell of coconut and this coconut milk shampoo and conditioner from Luseta smells amazing. It is not only the scent that makes it a great shampoo but as someone who has super dry hair ever since changing from the over the counter, drug store, sale shampoos and conditioners, my hair actually feels soft. It has been many, many years since I thought my hair felt nice. I know taking care of my hair has always been something I never spent much time on. I remember back in the day when I read Seventeen magazine as a kid I read that you should treat your hair the way you treat fine washables. Using the Luseta coconut milk shampoo and conditioner makes my hair smell and feel like I just came out of my hair stylist. Come to think of it, I should tell them about this brand. Even now as I right it I am touching my hair and smelling it. Great for all hair types too! My son and daughter have much thinner and straighter hair then me and it makes their hair smell amazing. They love it too. These bottles hold over 16 oz each. They are a nice size and even though they cost more than the .77 cents I usually spend, I feel like they go a long way. I am forever changed. No more drug store shampoo for me.